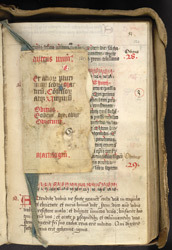 This martyrology or book of saints belonged to the English nuns of St Brigitta (or Brigittines) whose house, Syon, was originally located near Twickenham. After Henry VIII dissolved Syon in 1539, the Brigittines relocated in the Netherlands but then returned with the accession of Queen Mary (1557) only to be exiled again after her death. After wandering in France and Spain, they settled in Lisbon, taking this book with them. The manuscript contains a listing of saints arranged by the calendar of their feasts, notes relating to the monastery, lists of abbesses, confessors, and benefactors, and an obituary list of members down to 1639. The martyrology was not just a record book or diary. It was read from daily during a meeting of the community called chapter, in which a chapter from the rule that the nuns followed was read. After that one of the nuns would read the names of saints and others to be commemorated on the following day from the martyrology and identified them in some way (by their deeds, positions, etc.). The nun would then read from a list (the necrology) the names of dead of the community and its benefactors. Here is a page of the necrology with a prompt card which was attached to the book. The card gives the set phrase of categories of saints which formed part of the reading and lists the forms--singular, plural, masculine and feminine--of the proper titles for the names of the commemorated to be read.